We are located in the quaint Village of Caledonia, nestled in the beautiful Bellevue Valley of southeast Missouri – just a short and scenic 80-minute drive south of St. Louis. The Old Caledonian Bed & Breakfast resides in the grand Ruggles-Evans-Dent House, which was built in 1849 on four grassy, wood-lined acres right on the main street of Caledonia. This beautiful house is listed on the United States Register of Historic Places. A stay at the Old Caledonian Bed & Breakfast promises amenity, flavor, fun, and history. Amenity: Our spacious house and beautiful guest rooms offer vintage luxury and the comfort of triple-sheeted bedding and en suite baths. 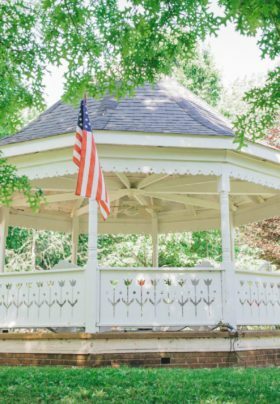 Our four acres of grounds offer many options for peace and quiet, relaxation, weddings, activities, and events. Flavor: Our bountiful breakfasts are prepared by a trained, experienced chef using locally-sourced ingredients. From fluffy pancakes and waffles, to savory frittatas and homemade tortillas topped with breakfast scrambles, our guests come back for our food again and again. Our delightful afternoon teas ,in our very own Tea Room, celebrate Caledonia’s founders’ Scottish heritage. Fun: The Village of Caledonia’s antique shops, vintage retailers, and craft stores share our block, including the Old Caledonian’s very own Amalgam Gallery of Art right on our property! The Village Barn reception/event hall is just on the other side of our property. Elephant Rocks State Park, Johnson Shut-ins, Dillard Mill, Mark Twain National Forest, Washington County State Park and Hughes Mountain State Natural Area are all nearby. Our area also features many vineyards and wineries, as well as fun-filled float trip services. History: History surrounds the Village. We are centrally located near historic landmarks, towns, and a Civil War battlefield, which make our area a favorite of enthusiasts from all over the USA. We look forward to having you as our guest at the Old Caledonian Bed & Breakfast! Subscribe for special offers and newsletters! Our guests LOVE Teatime! 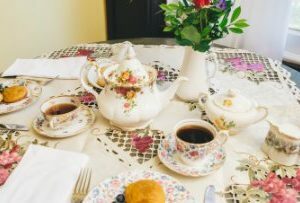 If you would like more information about our teatimes, or if you would like to schedule a private event in our Tea Room including teatimes, please contact us. We would love to see you for tea!